The methodologies available for the analytical quantification of the vulnerability of buildings which are subject to actions resulting from slope instabilities and landslides are relatively limited in comparison with other components of quantitative landslide risk assessment. 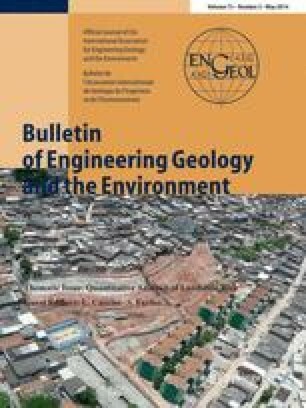 This paper provides a general methodology for calculating the vulnerabilities of reinforced concrete frame structures that are subject to three types of slope instability: slow-moving landslides, rapid flow-type slides and rockfalls. The vulnerability is expressed using sets of fragility curves. A description of the general framework and of the specialised procedures employed is presented here, separately for each landslide mechanism, through the example of a single-bay one-storey reinforced concrete frame. The properties of the frame are taken into account as variables with associated uncertainties. The derived vulnerability curves presented here can be used directly by risk assessment practitioners without having to repeat the procedure, given the expected range of landslide intensities and for similar building typologies and ranges of structural characteristics. This permits the applicability of the calculated vulnerability to a wide variety of similar frames for a range of landslide intensity parameters. The authors are grateful for the support of the SAFELAND project (grant agreement 226479) funded by the European Commission within its Seventh Framework Programme, and the project Big Risk, funded by the Spanish Ministry of Science and Innovation (contract number BIA2008-06614).